Use Charizard to fly back to Heahea City. Heal up your Pokemon and head to the right. You can enter the building to the right of the lab and speak to the lady on the second floor for a Lemonade if you'd like. You'll spot Lillie in front of the Dimensional Research Lab. If it's nighttime, you can find a Zygarde Cell near Lillie. You can also pick up a Big Mushroom by taking a small path right of the building. Enter the building and take the elevator to 3F. 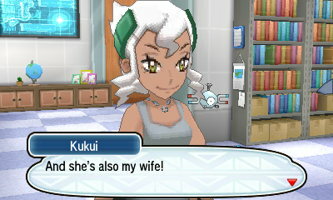 In this cutscene you'll meat Professor Kukui's wife, Professor Burnet, who will tell you about Ultra Beasts and the Ultra Wormhole. You'll need to speak to Lille and the professor again before you can exit the building. When you exit the building you'll catch a glimpse of an Ultra Wormhole. After a cutscene with Hau, head left and then south to Diglett's Tunnel. 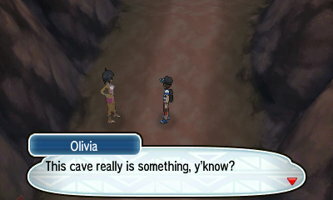 Speak with Olivia and then head south and take the right side of the fork to find a trainer and a Dusk Ball. Head back left and use Tauros to smash through some rocks and grab the Fire Stone behind them. 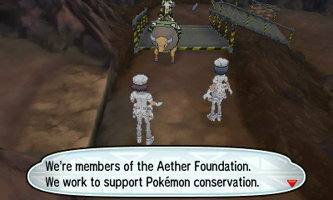 Head back right and up the stairs and you'll run into some Aether Foundation employees. Continue south and grab the Hyper Potion next to the wheelbarrow. You can go south through a little pathway and wrap around to fight another trainer if you want; otherwise continue right. 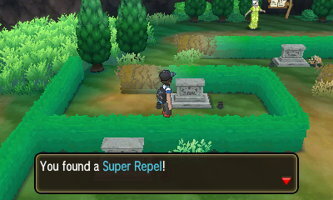 You'll find a trainer circling around a rock and a Zygarde Cell near a box. Go south from here and you'll run into Team Skull. 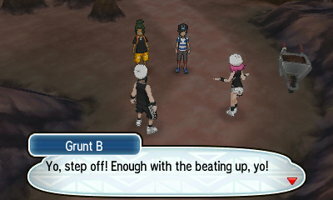 You'll need to double battle a couple of grunts with Hau as your partner. Hau will give you a Max Ether when the battle is finished. Exit Diglett's Tunnel onto Route 9. You'll have to battle a police officer here before continuing on the route. 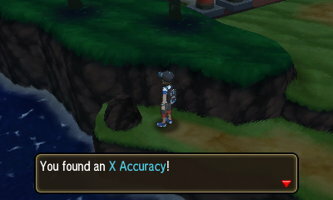 Before entering the city you can head south to battle a fisherman and pick up an X Accuracy by investigating the rock and a Net Ball in an item ball. Head into the city. 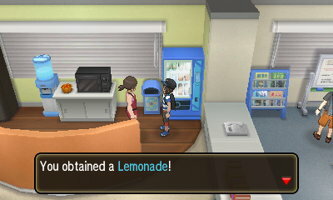 After a short cutscene, make your way to the Pokemon Center to heal up. If you continue to the end of town you can pick up a Eviolite and a Zygarde Cell near a bench. You can also speak to the lady here for Pikanium Z. Afterwards, enter the building accross the street from the Pokemon Center. 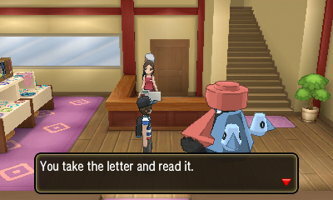 The Probopass here will give you a letter from Olivia telling you to meet her at the Ruins of Life. He'll also give you a Max Potion. Head right out of town towards the Memorial Hill. Here you can face off against a number of trainers and find a Cleanse Tag, a Super Repel, a Hyper Potion, and a Dusk Bull. 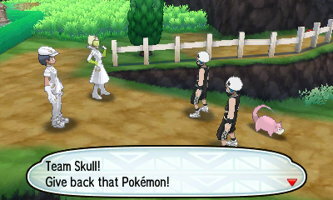 Continue right towards Akala Outskirts and you'll be stopped by members of Team Skull and the Aether Foundation. Make quick work of the grunt's Raticate and continue to the right. 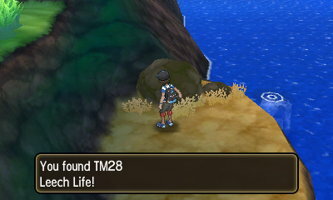 Here you can pick up TM28 - Leech Life on the shore to the right. There's a few trainers here that you can battle if you'd like as well as a Zygarde Cell next to a cliff to the left. Head north in the Akala Outskirts to enter the Ruins of Life. 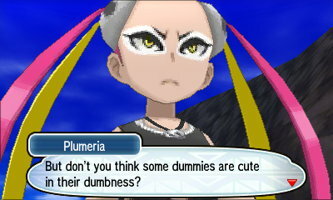 Before you enter the ruins, you'll be stopped by Team Skull Admin Plumeria who will want to battle. She has a Lv. 25 Golbat and a Lv. 26 Salandit. Continue north after defeating her. A dialogue will begin between Burnet and Lillie. Lillie will also heal your team. Olivia will then challenge you to a battle: accept the challenge when you're prepared. 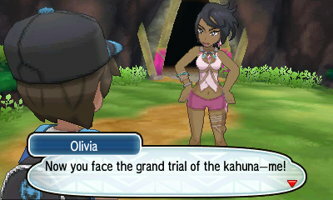 Kahuna Olivia specializes in Rock type Pokemon and will have a Lv. 26 Nosepass, a Lv. 26 Boldore, and a Lv. 27 Lycanroc. Watch out for the Z-Move Continental Crush from Lycanroc, it will likely one-hit KO any of your Pokemon. 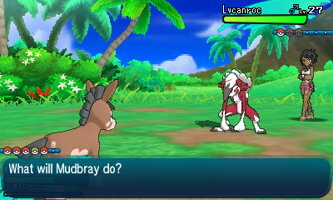 A strong Water, Grass, or Fighting type will make this battle much easier. Olivia will also use a Super Potion to heal, so be ready for that. 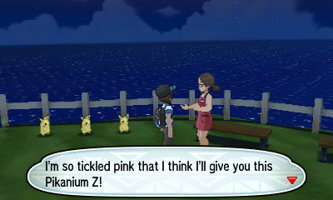 When you defeat her, she'll reward you Rockium Z and a cutscene will give you direction on where to go next. Your Grand Trial will be complete.